It's the stuff of nightmares. 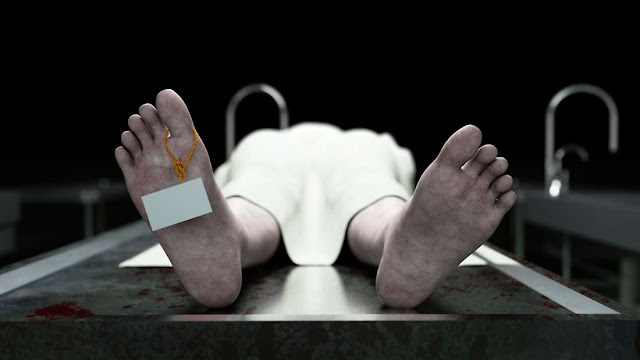 You fall asleep one day, and wake up to find you're in a morgue, with morticians waiting to perform an autopsy. That terrifying nightmare happened to one man this week, after doctors pronounced him dead on Sunday, only to discover he was still alive. Gonzalo Montoya Jiménez, a prisoner in Spain, was found unconscious in his cell on Sunday morning, local newspaper La Voz de Asturias reports. Shortly afterward, he was pronounced dead by three doctors at the prison, having found no signs of life. His "body" was bagged up and then moved to the mortuary at the Institute of Legal Medicine in Oviedo, where he was prepared for autopsy. This included putting marks over his body, which are used to guide the coroner. His family were even informed that he had died. Thankfully, before the autopsy could be performed, the 29-year-old started showing signs of life, which were noticed by the forensic team preparing him for autopsy, his family told La Voz de Asturias. He was transferred to an ICU in a nearby hospital where he recovered enough to talk. Upon waking, he asked about his wife, who has been allowed to visit him in hospital. Doctors say his brain had been starved of oxygen during the ordeal, but the fact that he's talking and remembering are good signs of recovery. So why was he mistaken for dead? According to Informativos Telecinco, it is believed that it could be a case of catalepsy, though that hasn't yet been confirmed. Catalepsy symptoms include rigidity, unresponsiveness, and loss of muscle control, as well as slowing of vital bodily functions (such as breathing). It's easy to see how someone showing signs of catalepsy could be mistaken for dead. Catalepsy is itself a symptom of epilepsy, which La Voz de Asturias reports Jiménez suffers from, so it would make sense if this turns out to be the case. It's unknown whether medical staff at the prison were aware of his epilepsy when he was pronounced dead. "I can’t comment on what happened at the Institute of Legal Medicine but three doctors have seen clinical signs of death," a spokesperson for the Spanish Prison Service told The Sun. "So it’s still not clear at the moment exactly why this occurred." Being mistaken for dead is a surprisingly common occurrence. In 2014, a 91-year-old Polish woman was declared dead, only to wake up in the morgue, complaining about being cold. In February of the same year, coroners in Mississippi were surprised when a 78-year-old man began kicking against the sides of his own body bag.